Chanel, of course. Classic, luxe. Isn't it beautiful? I don't like double breasted jackets but, with the lapel and scarf, and the trim, I'm sold on it. And have you seen the Chanel ad from the same issue, with the black jacket that looks overly bedazzled in the very best way? I'm predicting a future DIY project and tutorial for someone on the WWW. All of these are Alexander McQueen but I can't take my eyes off the sculpted houndstooth number in the middle. The asymmetrical neckline, the mounds of folds, the wrapped bodice... wow. Next time you need to blend in with houndstooth wallpaper, a la Garden State, you'll know what to wear. I totally, completely saved the best for last. I was on the airplane flipping through this magazine a few weeks ago when I came upon this image. Of course, in print it's much bigger. I kid you not, the Rodarte leather jacket (left) took my breath away. I assumed it was lack of air pressurization in the airplane but Louis and everyone else on the plane was fine. Yesterday I was going through the mags to rip out images to save and recycle the rest, and this jacket, again, drew air from my lungs and held me in a state of suspension for a few moments. It is absolute and utter perfection. All the buckles and straps look vaguely random and haphazard, but there's a lot of intent and meaning and vision. This image, once I catch my breath, might just inspire me to motion. I like the houndstooth too, and that girl knows her outfit rocks. Those sleeves--oooh, yeah. I have a pattern in mind! How cool are the little umbrella hats! Love the crazy patterns too, thanks for sharing! I love how fitted that top Chanel suit is. And the cute little trim around the jacket and skirt edge. 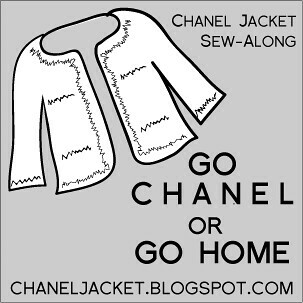 I reckon the ultimate refashioning challenge is to make a Chanel style jacket from a men's thrift shop coat. Are you up for it? thanks for the heads up! I am going straight to Borders to pick up that issue. the houndstooth piece alone is worth it! I'm the same way too. We have had an unexpected and enduring heatwave in Sweden and all I can think of is black clothes and the new shawl that I just bought and want to wear. Those photographs and clothes are amazing, I have actually promised myself to buy more foreign fashion magazines during this summer holiday, so W is definitely on my list now!